3D Snowflakes are gorgeous and look complicated to make. Actually, they are pretty easy to do. All you need is six 8 1/2 x 11 pieces of paper, scotch tape, scissors and a stapler. Bend to make a triangle. Make three cuts equally spaced apart. Get as close to the crease edge as you can. Do not cut the crease. You need to make six cut triangles. It's important to make all the same. When you open the paper up, it will look like this. Next you will be curling and taping. I numbered each layer to make it easier to explain. Curl #1 and use scotch tape to hold together. Turn over and curl #2 and #4. 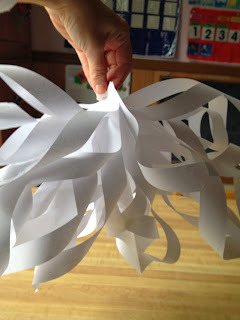 Staple the tips together to make the center of the snowflake. Spread apart and hold two sides together. When you hold two sides together you will see what looks like an X. You want to staple the two 'X's together. It's a bit awkward, but you'll get the hang of it. These snowflakes make very pretty winter decorations. OK - that is the coolest thing ever!! Pinning it to remember how to do it! That's better than those book trees I recall seeing many years ago. Have you tried doing one out of something other than paper? I don't know what a book tree is. Is it like a pop-up book? I have only used paper for the snowflakes. Find me on Pinterest, I have it there. No not a pop-up book. You use an old book (it is destroyed in the process) or thick magazine. Open the book so that the covers are touching (front to back) then you fold all the pages the same in to make a tree shape. After you get the shape you spray paint it. They don't even think they looked that good. That is so cool....thank you for sharing! Skype me if you run into trouble.